The fingerprint recognition determines whether two pictures of a finger and the same finger or not. Each of the ten fingers of the same person in terms of the fingerprint pattern different. The method of fingerprint recognition is the oldest procedures and so far as is absolutely safe and reliable, and is today the most widely used biometric procedures. Usually, the identification of the human fingerprints Daktyloskopen leave, it is proving to be a labour-intensive and time consuming, and is also costly. Within the last 30 years, a significant process in the development of automated fingerprint identification systems occurred. Traditional color and Abrollverfahren the finger image through electronic fingerprint readers (optical, capacitive, ultrasonic, thermal) which generate a digital image, has been replaced. The oldest procedure, the biometric fingerprint dar. We can not say exactly who discovered the fingerprints, because he was always there, as long as there are people, and eventually, he was observed and encouraged to think. After LOCARD can be three different periods in the history of Daktyloskopie: the prehistoric, the empirical and scientific period. Daktyloskopie means a fingerprint analysis procedures by the characteristics of the skin bar reliefs, especially the fingers berries, and serves the police detection service. The history of the fingerprint is on the 7th Century AD in China. However, there HEINDL clues so that the fingerprint already in the year 2200 BC by the Babylonians and Assyrians discovered and a signature on clay has been used. The first Chinese author of fingerprints for identification purposes mentioned, Kia Kung-yen, which is about 650 AD during the Tang period wrote. During this time, fingerprints for loan contracts used to Identitätsschwindeleien be avoided. The Chinese Family Law Act was in the book "Yung-1684 as the English Pflanzenmorphologe NEHEMIAH in his GREW in the Philosophical Transactions, published the article "The description and use of the Pore in the skin of the hands and feet" 222 grooved with the same distance on the fingers recognized. 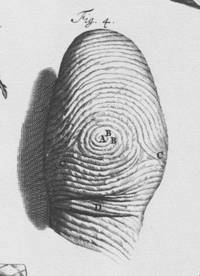 In another publication in the year 1685 of GODEFRIDI BIDLOO be Minuzienendungen and bifurkationen the Papillarlinien, which now computerized biometric techniques used to detect Henry Fauld scientifically 1880 has the individuality of fingerprints discussed. The first scientific publications on the classification of the fingerprint Papillarlinien in Europe go back to the dissertation "Commentarii de examine physiologico organised visus et systematis cutanei", which by 1823 JOANNES EVANGELISTA PURKINJE at the University of Wroclaw was presented, and not on GALTON Francis, a Charles Darwin's cousin, as often in the literature is listed. The thesis identified with the "types" of Papillarlinienverläufe are the foundation for subsequent fingerprinting registration methods and comparable to the origin of Daktyloskopie. The work was repeatedly translated, reprinted and refined Others GALTON of (1822-1911) and RICHARD EDWARD HENRY. Much of the literature on the Daktyloskopie indirectly based on the work of PURKINJE, and so far is the "Galton-Henry system" in the world Daktyloskopie a Begriff.Der first Europeans, the fingerprint used to police purposes, was the Englishman WILLIAM HERSCHEL JAMES (1831-1907), between 1853-1878 in the Indian Hooghly district as an official in the civil administration was working. The fingerprint was for the payment of pension entitlements and criminals, and HERSCHEL In this way, thousands of fingerprints collected and thus a large field trial unternommen.Mit adoption of 12 June 1897 in British India was HENRYSCHE fingerprinting officially introduced. On 21 July 1901, it was then in England after four years. In Dresden, the Daktyloskopie after the system HENRY 1 April 1903, in Berlin on 20 June 1903. With the upturn in the computer and electronics industry was in the 60iger years ago, after computer search procedures. In particular, the United States, France and Britain dealt with the development of AFIS systems, so that the use of commercial applications stimulated. 1972 was amended by the FBI with Cornell Aeronautical Laboratory, a contract on the development of a prototype for an AFIS system. Meanwhile, the FBI has a collection of over a million finger images, and this makes about 40 terabytes of image data (40 * 1012). After HONG there are already 70 million, compared to 810,000 in 1924. Fingerprint recognition systems can be summarised as other procedures divided into civilian and forensic applications. With regard to the forensic applications spoken often of AFIS systems. These AFIS systems are computerized fingerprinting system, the police authorities and also by the FBI and the CIA in the United States are used. These systems provide a residual amount of potential fingerprints from a database of several million records, with the "expert" at the end of the final decision. Such systems are, however, the detection service.